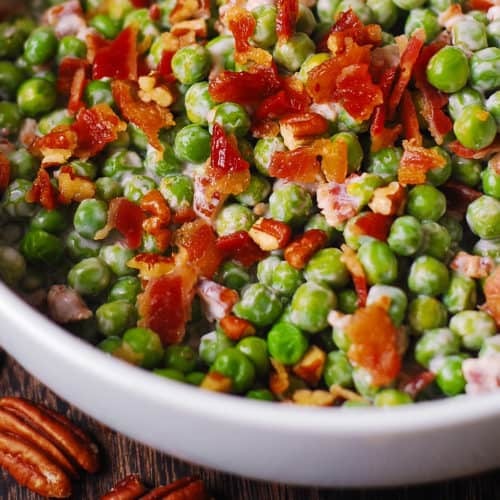 Creamy and crunchy salad with peas, bacon, and pecans – easy side dish that will go with many different kinds of meals! 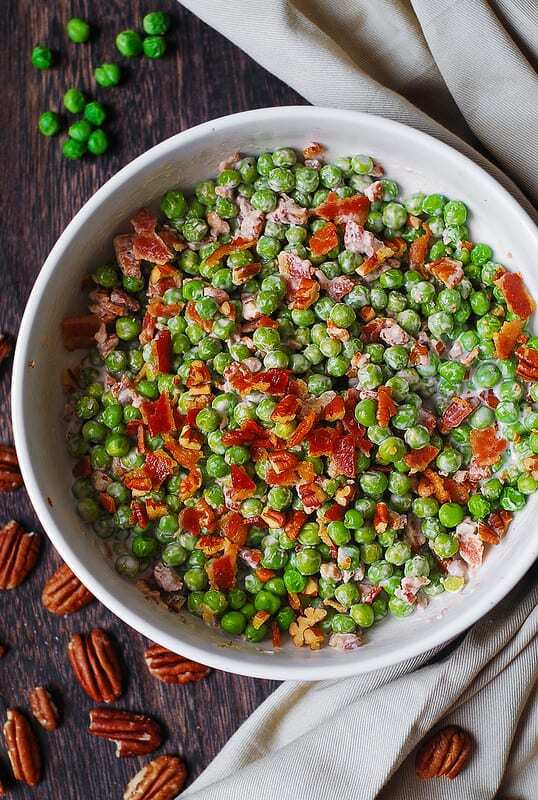 Not only is it a simple and delicious everyday side dish, this creamy pea salad with bacon and pecans will also make a wonderful holiday salad, looking great on your Thanksgiving or Christmas table. 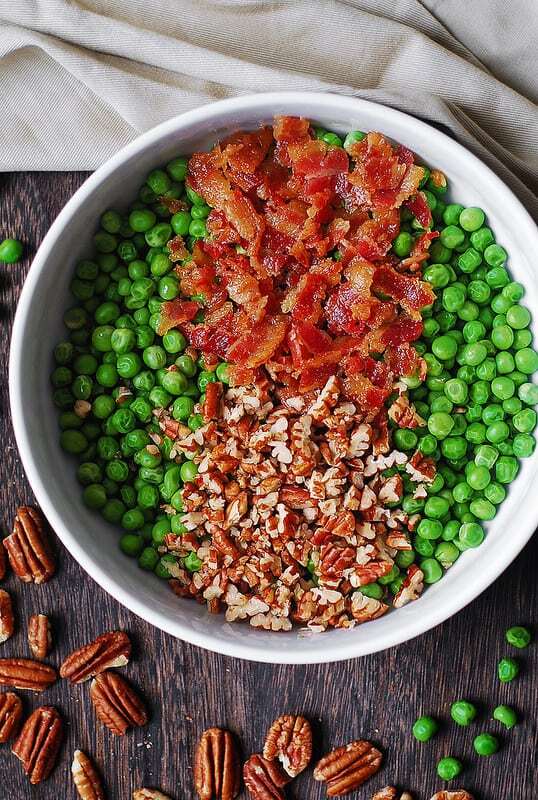 I happen to love green peas, bacon, and pecans – so this is a perfect combination for me any time of the year, but especially in the winter, when this salad looks cozy and inviting on a dinner table. 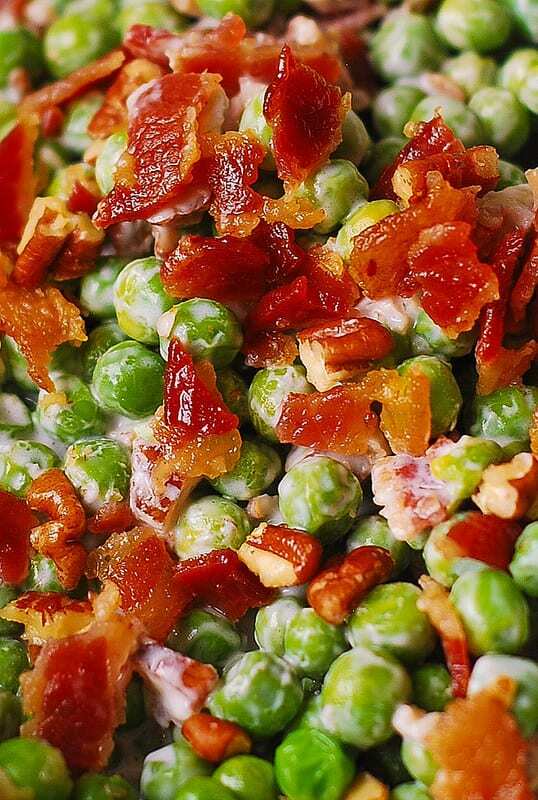 Next, add the salad dressing right before serving, so that the salad retains its crunchiness from bacon and pecans. 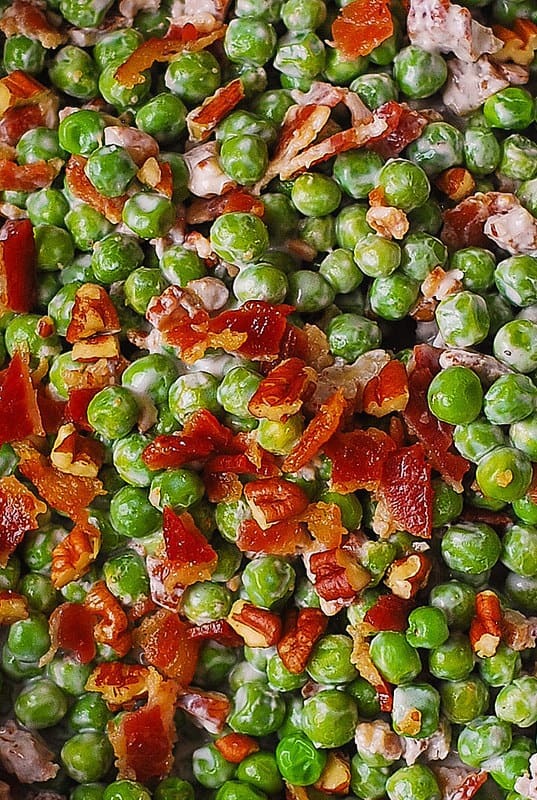 Creamy and crunchy salad with peas, bacon, and pecans. 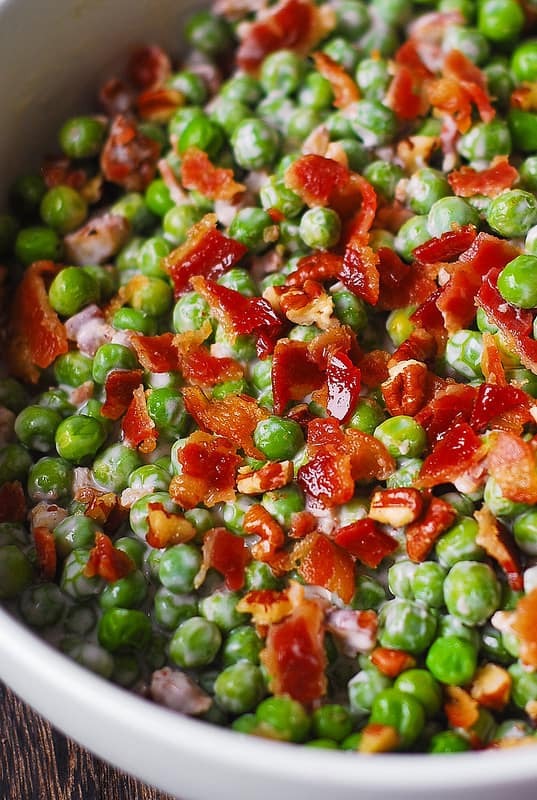 Delicious everyday side dish! Also, a great holiday salad, perfect for Thanksgiving and Christmas! 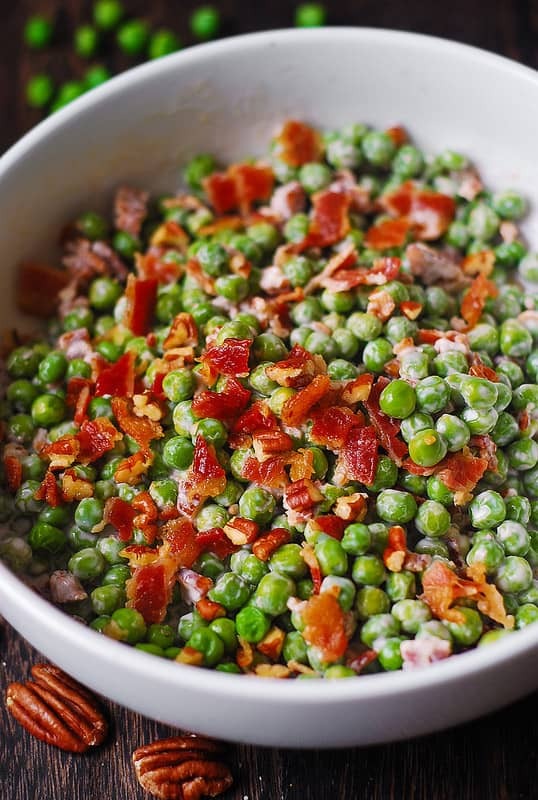 Cook frozen peas according to cooking instructions (usually, by bringing water to boil, adding peas, reducing heat to medium in cooking in this water for 5 minutes). Drain. 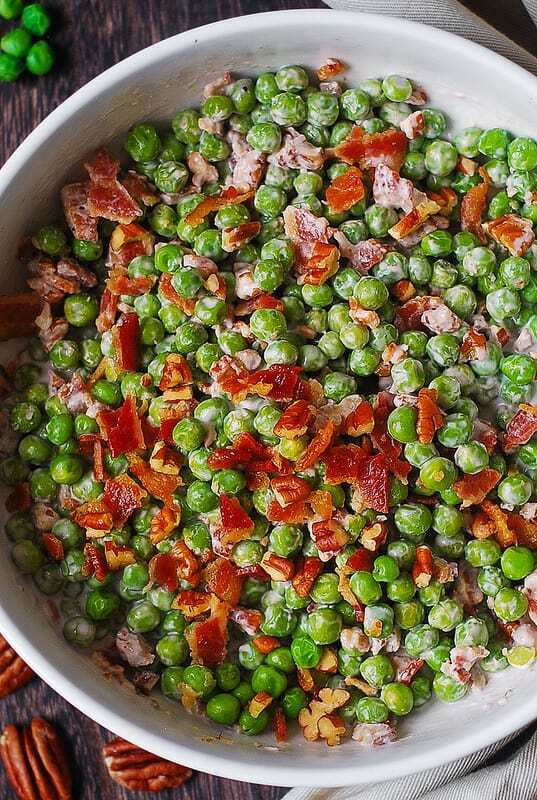 Combine cooked peas, cooked and chopped bacon, and chopped pecans in a bowl. In a small bowl, combine mayo and sour cream (or unflavored Green Yogurt or unflavored Kefir), mustard, honey, lemon or lime juice. Make sure the honey is softened, warm it up if needed, so it mixes in easily. Whisk the salad ingredients together and taste. Add about 1/8 teaspoon of salt, to taste. Add salad dressing to the salad. Add more mustard or more lemon juice or more salt, if needed.